And/Or have show consistent improvement in their behaviors. The Kennett Consolidated School District is proud to announce that U.S. News & World Report has once again named Kennett High School one of America’s Best High Schools. To produce the 2017 Best High Schools rankings, U.S. News & World Report teamed up with North Carolina based RTI International, a global nonprofit social-science research firm. The comprehensive rankings methodology is based on the key principles that a great high school must serve all of its students well, including disadvantaged populations, and that it must be able to produce measurable academic outcomes to show it is successfully educating its student body across a range of performance indicators. Additionally, the graduation rate for ranked schools is 15 percent higher than schools that are not ranked. New this year, U.S. News & World Report began factoring Advanced Placement® (AP) exams in the ranking methodology to highlight schools that exposed their students to a diverse and rigorous high school curriculum. With an AP pass rate of 66 percent (meaning students scored a three or higher on an AP exam), Kennett High School students have shown that they can rise to a challenge. For more information on the U.S. News & World Report’s ranking processes and details on Kennett High School’s rankings, please visit www.usnews.com/education/best-high-schools. Visit khsminithon.org for more information about our club and how you can support us! Come out and support Kennett High School Mini THON; it would be awesome to see the Kennett community having dinner together! 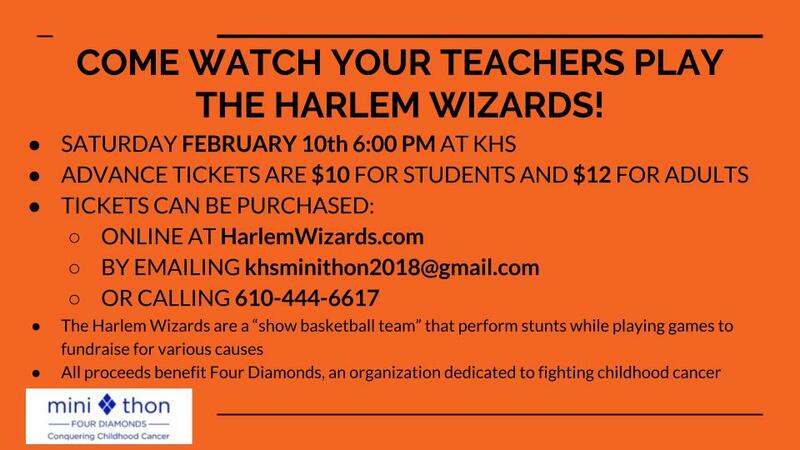 Come join Kennett High School for a night of family fun as KCSD teachers play the Harlem Wizards on Saturday, February 10th at 6:00 pm at Kennett High School. The Wizards are a performance basketball team delivering widely successful fundraiser events for schools and nonprofits, last season alone playing in over 400 communities across the USA, while raising over $200 million. They are a unique basketball team that is not primarily focused on winning games, but rather entertaining the crowd with a variety of basketball tricks and alley oops. What makes a Wizards show “awe-inspiring”? Some say it’s the oohs and ash created by the thunderous, sky-high slams. For others it’s the humor and seeing the teachers being good sports and having fun on the court with the Wizards. The comedy, audience participation, spontaneity delivered as a world class show, in an intimate community setting adds up to a night to be experienced and treasured. We hope everyone can join us on February 10th for an evening in which all of our schools and the whole Kennett community comes together!